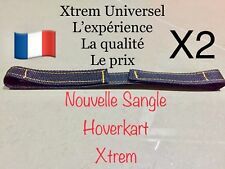 Lot de 2 Sangles hoverboard hoverkart avec crochet boucle et scratch. Coté Scratch Doux : 35 cm. Sangle vendu par paire. Coté Scratch rèche : 10 cm. -Toile fabriqué en France. -Cellule de toile tissé. The District C050 Series Pro Trick Scooter has the latest low profile 110mm x 24mm Wide Wheels - White and Gold. The short deck and bars of the District C050 pro scooter make it an ideal choice for beginners and younger riders. Fork: Prodigy 6061 Aluminium IHC forks. Scooter Parts. Complete Scooters. CALL US ON01794 830005. About Skates UK. Need help?. Product Information. Brake: Nylon Bolt on Brake. Nerf Guns and Accessories. Using recycled materials, not only reduces costs, but saves energy and reduces greenhouse gas emissions which is our contribution to help tackle climate change. Recycling Ethos. Hauteur du guidon : 83 à 98 cm. Mode d'emploi en français (autres langues : allemand, anglais). Fusibles de rechange. 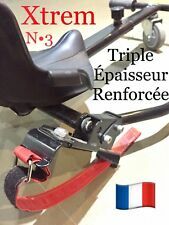 1 x trottinette électrique. Poignées antidérapantes. Roue arrière motrice par courroie. The easy to ride Razor Power A2 electric scooter features a kick-to-start, high-torque, hub motor, providing lithium-ion powered electric scooter action at speeds up to 10 mph (16 km/h) for up to 40 minutes of continuous use. Takira V8 scooter électrique trotinette 120W 16 km/h batterie 2 freins. Poignées antidérapantes. Structure en acier robust. Plateau antidérapant. Hauteur de colonne de direction réglable avec blocage rapide (3 hauteurs). MX Trixx - Black/Green. Upto 100Kg. Teen Trick/Stunt scooter. Genuine Original Micro Scooter. NEW but Box is creased to edges & corners. Hoverkart Universel Pour Gyropode hoverboard Noir pour 6,5" 8" 10"
A fixer sur un hoverboard électrique. Hoverboard non inclus. Coloris : noir. Compatible avec la majorité des modèles d'hoverboards de 6,5" à 10". Baissez les 2 poignées, il avance ; relevez les 2 poignées, il recule. Die schlanken Rollen erlauben hohe Geschwindigkeiten und viel Fahrspaß. Roller waren früher nur etwas für Kinder. Die Zeiten haben sich geändert und heute fahren auch viele Jugendliche und Erwachsene Scooter. Pour les longues distances : portée jusqu'à 28 km. Roule jusqu'à 22 km/h avec 5 vitesses et a une portée jusqu'à 28 km. Avec la fonction easyfold, il se replie en quelques secondes en une taille pratique au cas où vous voudriez le transporter. Scooter Deck Neochrome Rainbow Inc Flex Brake, Grip Tape, Headset Custom HQ! Integrated Rainbow Headset. Fully Integrated Headset Rainbow. Grip tape pre-cut to fit the Team Dogz "Pro-X Ultimate" Scooters. 1 - 1/8" Threadless Headset. Transparent Grip Tape (Unattached). 1 x Rainbow Headset. Blindside 360 Pro Stunt Scooter. 100mm Alloy Core Wheels. Reinforced Deck. New but Box v.Poor. JD Bug Scooters have created what they believe to be the best Commuter Scooter they have ever produced. Dual Bearing System for a Faster, Longer, Smoother Ride. Ergonomically Designed to Reduce Stress on the Lower Back When Scooting. 1 x Y Flyer Scooter. Item number 100739. Suitable for boys and girls aged 7 and over. INCLUDES TANNER FOX LUCKY PRO RIDER SIGNATURE CARD (while supplies last). We added a newly designed KinkBar™ and Huracan™ HIC fork and Lucky Lunar hollow core wheels along with TCS™, TRES™ Clamp, and a Lucky Revo™ headset. Super clean to the touch. Has the quick connect for when you fold it up. Nice handle pads. Black deck. Rolls great. Full Sacrifice Flyte Custom Stunt Scooter - super light weight 2.8Kg's. - ridden with no brake. Aluminium wide bars, a 2 bolt nutron clamp - IHC cyborg fork - 10cm wide deck. Great Gift Idea!! Same Business Day Handling From USA!